« So What is a Mini-Farmer? Yesterday was a thrill. 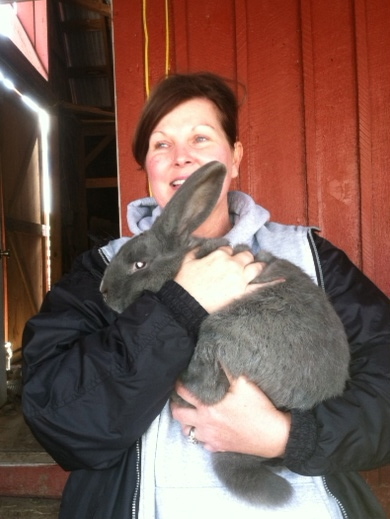 My friend Rachael called and asked if she could come out and see my rabbits. I was elated! My first official mini-farm tour! Well, my first voluntary tourist anyway. In the months since I got my mini-farm up and running, I’ve forced tours on many unsuspecting guests -friends who came over for dinner, parents of my kids’ playmates, my mother’s exercise buddy, my brother’s in-laws here for my nephew’s birthday, and the meter reader – have all been treated to a trip through the mud and the muck to view my chicken coop and rabbit hutches. Everyone has dutifully complimented the cuteness of the rabbits or the lovely color of my hens, but I think they were mostly being polite. But Rachael came for the express purpose of touring my mini-farm. It was totally her idea. Totally. Fortunately, Hal had repainted the barn (barn red, of course) over the summer , and it was a striking sight against the brilliant blue winter sky. Just last week, Hal,the littles (our two youngest blessings), and I had shoveled out the mound of poop that had been accumulating under the rabbit hutches for weeks. Much like I do with empty oatmeal canisters and jelly jars, I had been hanging on to that poop thinking surely I could do something with it. I offered it to some organic farming friends of ours, but they said that since we feed our rabbits Bermuda grass hay, their poop it is worthless. Rabbit poop, normally pellets of gold to crop farmers, can’t be used if it is full of bermuda grass seed. Who knew! Anyway, we shoveled out the poop, and Hal spread it out in the pasture where we grow Bermuda grass -so next year’s hay crop should be awesome. Not sure why we didn’t think of that before. Hal put buckets under each hutch to catch the pellets and make future cleaning easier and to keep the poop relatively out of sight. Point is – the place looked great. And the rabbits! The rabbits were at their most adorable. The babies, instead of huddling in the corner of the hutch as they often do, scampered and played about with a delightfulness that would have made Walt Disney proud. Cornelius, one of our bucks, practically rolled over on his back and kicked his legs with pleasure when we petted him. Curby (pictured with Rachael below) was his usual snuggly self. They all seemed to sense they they were “on”. Of course the littles were in full tour guide mode. Oh, they acted cool, like being farmers is no big deal, but I could tell they were bursting with pride at their little farm. They love showing off the farm even more than I do. They told Rachael about each rabbit – it’s likes, habits, how it got its name. She was so kind. After we hung out with the rabbits and chickens for a bit, we sat in the sun on my Chicken Therapy Bench (long story – more on that later). And chatted about life, livestock and small town living (and shoes and anti-aging creams). It was a lovely morning. Since I teach full-time and have four busy kids to keep up with, I know some people have questioned my decision to take on livestock.Why would I want one more thing to feed and care for? I haven’t yet addressed on this blog the reasons I wanted to do this or why I love it. I will get to that. But I can tell you that yesterday, spending a morning with a good friend, my kids, and my livestock, was a very very good day. Farm on!